Fast forward five years. We got married, lived in a tiny rental house that had no space for a coffee table for almost 4 years and stored the old drum in the cellar (yes, an actual cellar. A terrifying cellar.) Then we moved to Texas and bought a place, and it was time. 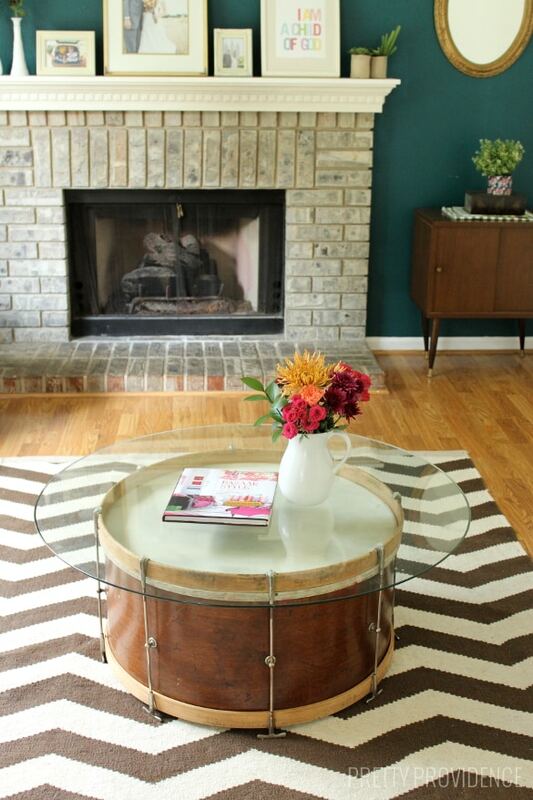 We wanted this coffee table to happen! 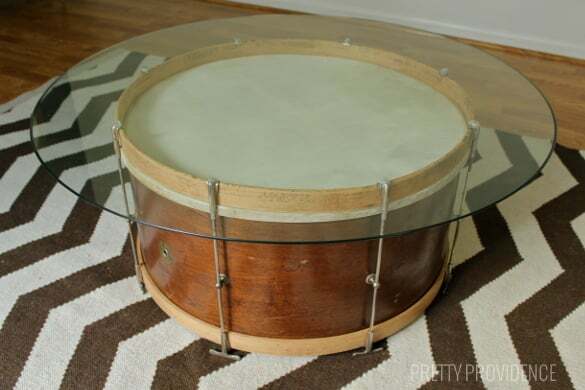 Jacob started stalking craigslist for round glass tabletops that would fit on top of the drum with not much luck. Everyone was asking too much for their silly glass table tops. 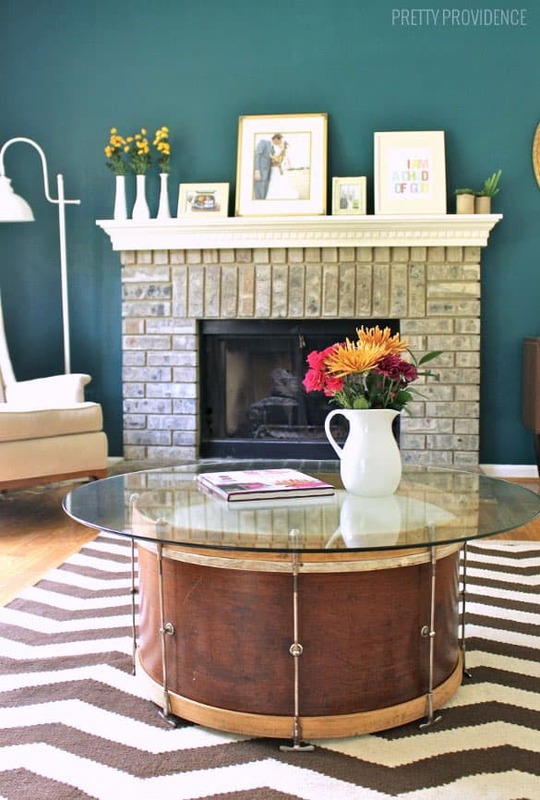 We were not going to pay very much for a hunk of glass tabletop because we knew something would come along. Eventually it did, and a few months ago Jacob jumped in Blanca again and picked up this almost-new glass tabletop for $25. It was the perfect size and the price was right. This is not really a DIY post because all he did was clean the drum and place the table top onto the drum’s claws (metal thingys.) To prevent scratching he added some rubber stops as a buffer. That was easy! This is now one of our favorite pieces of furniture. It’s super unique so it is a conversation piece whenever people come over. We love it. Not to mention it only cost $45 total. Now I’m trying to think of what other cool things we could repurpose into furniture. The possibilities are kind of endless, ya know? As you can see the drum has some scratches and isn’t in perfect condition but I think that adds to it’s charm. The thing is almost 100 years old! 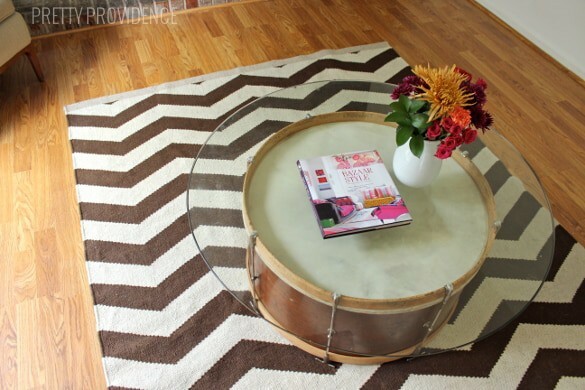 If you’re curious about the book I have laying there, it’s called Bazaar Style, it’s awesome and actually very fitting to be on top of a salvaged drum coffee table. 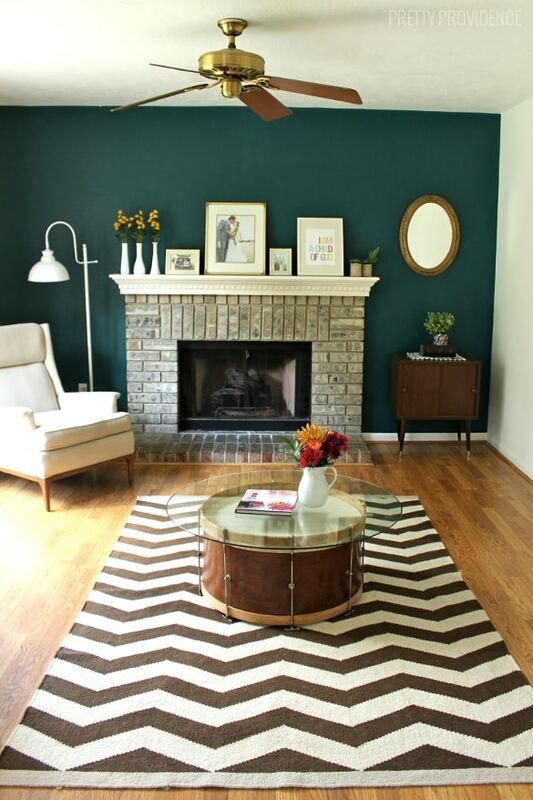 It’s all about mixing vintage with new and making different design styles work together. I like to look through it when I need ideas or inspiration! What is the best thing you’ve ever found at a yard sale? Have you ever repurposed something old into a completely different thing? 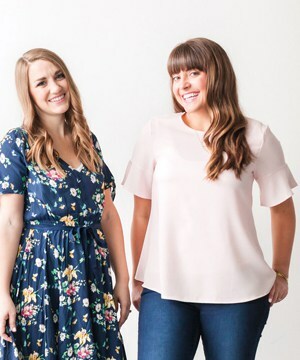 I want to know – and if you’ve blogged it leave a link so I can see! I have done a whole post with yard sale tips, in case you’re interested! You might also like this DIY Ikea Hack Desk. « AMAZING Get Away Today Giveaway!!! I loved reading this post. I am inspired to go to some yard sales albeit “alone”. Your story about your hubby and you going together as a tradition is very cute. This will be a perfect weekend to do it too, with the “cold front” (temps will be in the 70’s) coming through and all! This is such a cool idea! Being a musical, yet thrifty person, this project totally speaks to my heart. Great job thinking outside of the box!! Thank you! I think that is why we love it so much too. I’m not a musician but my husband is and I’m an admirer of musicians ;) haha! Sarah, I LOVE this! 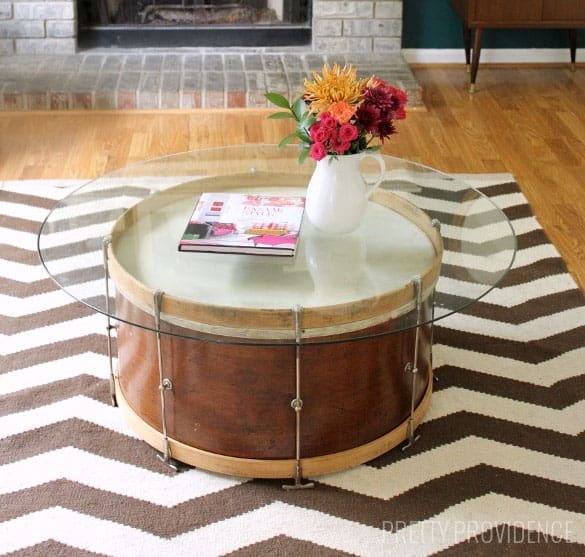 My husband is a drummer, too, and he would probably flip to have this in our home. I need to start hitting up my local yard sales now. This really is so cool!